We, Asian River Restoration Network (ARRN), send you the "ARRN newsmail Issue 4". The function of the secretariat of ARRN is currently carried out by the secretariat of JRRN, Japan River Restoration Network. JRRN delivers the "JRRN News mail" written in Japanese twice a week to JRRN members (18 organization & 410 individual member as of Mar.10), which covers topics offered by ARRN/JRRN member and river restoration colleagues, and latest news on river restoration in Japan. To introduce our activity of one of ARRN's national network, we send you the latest issue of "JRRN News mail, Issue 279 (March 8, 2010) " in English. During the period of August 18 (Tue.) 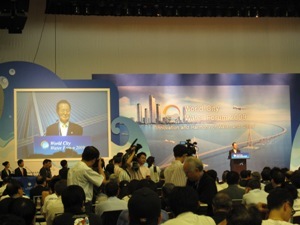 to 21 (Fri.), 2009, the “World City Water Forum 2009 (WCWF 2009)” was held at the Songdo Convensia in Inchon City, Korea. It brought together about 5,000 specialists involved in city water issues, who exchanged information on up-to-date technologies and experiences. The JRRN Secretariat sent Ms. Numata (Planning division, Foundation for Riverfront Improvement and Restoration) to the forum to give his presentation, entitled “Trends for Urban River Restoration in Asia and Efforts toward Establishing an International Network”, at a technical session of “Restoration of Urban Stream Amenity”. 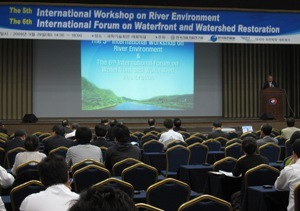 During the forum, there were other sessions related to river environment on the theme of aquatic ecological restoration, regional revitalization through riverboat transportation, etc., in addition to urban river restoration, which introduced diverse case examples in Korea as well as other countries. →　Website of "Warld City Water Forum 2009"
On August 17 (Mon. 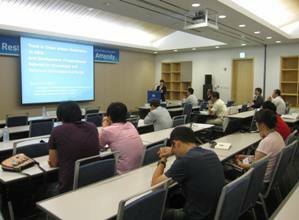 ), 2009, the Second ARRN Information Committee Meeting and the Second ARRN Technical Committee Meeting were held in Inchon City, Korea. 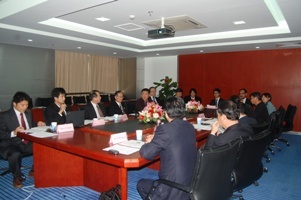 These committee meetings were held following the First ARRN Information and Technical Committee Meetings (September 2008/ Beijing City, China). In the Information Committee Meeting, discussions were held with regard to the ARRN mid-term action plan until the Sixth World Water Forum (March 2012), the organizational framework for network expansion, and future collaboration with the European Centre for River Restoration (ECRR). In the Technical Committee Meeting, there were active exchanges of opinions mainly on how we should upgrade the “ARRN River Restoration Guidelines Ver. 1” issued in March 2009, after a presentation of the latest report on river environment in each country. 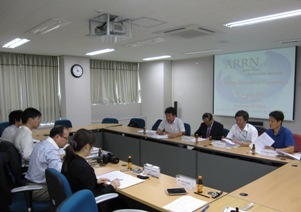 Based on the results of these discussions, the ARRN Secretariat will promote coordination with related organizations in Japan, China and Korea, and will determine the future activity policies of ARRN in the Fourth ARRN Governing council Meeting to be held in Seoul City, Korea at the end of September 2009. We, the Asian River Restoration Network (ARRN), inform you our publication of the "Reference Guideline for Restoration by Eco-Compatible Approach in River Basin ver.1". If you would like to receive the PDF version of this guideline, please contact to the ARRN Secretariat (secre@a-rr.net). In addition, the function of the Secretariat of ARRN is currently carried out by the Secretariat of JRRN, Japan River Restoration Network, and JRRN distributes the "JRRN News mail" to JRRN members in Japanese twice a week. Since we successfully deliver the 200th issue last month, we send an English version to you as reference information. "ARRN Annual Report 2008" has been published. Major activities by ARRN and National Networks (CRRN, KRRN and JRRN) in 2008 are introduced in this report. 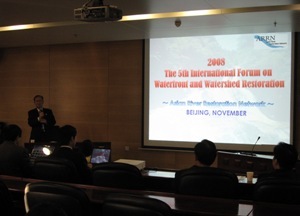 On Nov. 4, 2008 (Tue), the 3rd ARRN Governing Council Meeting was held at the China Institute of Water Resources and Hydropower Research (IWHR), the CRRN secretariat in Beijing. At the beginning of the meeting, the current chairperson, Prof. Nobuyuki Tamai (a professor of Kanazawa Gakuin University, a professor emeritus of the University of Tokyo, president of IAHR) was reappointed as the incoming chairperson at the expiration of the his term of office (two years) under the agreement of Japan, China, and Korea. The activities of this year were then reported and discussed and opinions were exchanged in terms of ARRN charter, policy for activities next year, the place to hold the international forum next year, and how to establish the river restoration guideline. 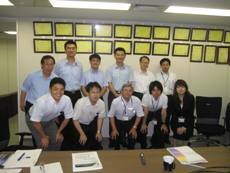 JRRN secretariat was asked by JRRN members to assist the Taiwanese government staff with the inspections of case studies of improved water environments (water treatment and water reuse) in Japan. The JRRN Secretariat supported preparatory coordination with inspection sites and two-day site visits. They visited the Metropolitan Area Outer Underground Discharge Channel, Kogasaki Purification Facilities (for the rock bed-contact purification of the Sakagawa River), and Tokyo Metropolitan Ochiai Water Reclamation Center. The inspections were meaningful thanks to briefing by facility staff and an exchange of opinions. 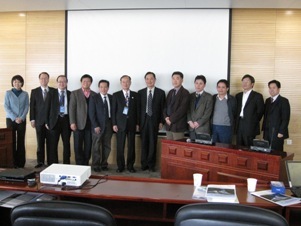 The 1st ARRN Information Committee was held at the China Institute of Water Resources and Hydropower Research, Ministry of Water Resources in Beijing, China, on September 24, 2008, AM. The issues discussed in this committee include; policies for future actions of ARRN; means to exchange information on river restoration among ARRN members; and how to facilitate each country’s network (RRN). The results were incorporated into the agenda of the 3rd ARRN Governing Council meeting held in November 2008 in which the action policy of ARRN was discussed. "ARRN Newsletter Volume 1 (July 2008)" was published. River restoration projects and trend in Asia are introduced in this issue. 14 members including the representative of Citizen’s Group to Create Healthy Dorimcheon visited Japan and exchanged opinions with ARRN Secretariat. Based around Dorimcheon in Seoul, Korea, the Citizen’s Group to Create Healthy Dorimcheon was established in 1999 and has expanded its members as much as 300. The objectives of its activities are to protect the environment of Dorimcheon basin and Gwanak-gu area with support of local citizens, and to pursue sustainable society and co-existence of nature and mankind for the betterment of people’s lives. At the opinion-exchange meeting, ARRN Secretariat introduced historical development of Japanese river environment administration, current projects for river restoration, and proactive efforts made by citizens including children towards restoring rivers. The Dorimcheon NPO in turn introduced activities carried out by children and then both parties vigorously exchanged opinions. On June 26, 2008, ARRN Secretariat had a meeting with Dr. Ulrica Åberg, the researcher of the School of Environment, University of Leeds, UK. As a part of his research to compare river restoration projects between Japan and Europe, Dr. Ulrica Åberg conducted field studies to collect examples and information during his short stay in Japan. ARRN Secretariat provided information regarding historical development of Japanese river environment administration, representative measures and examples, procedures for river restoration projects, and evaluation of the projects implemented in the past. Dr. Ulrica in turn explained current situations regarding river restoration in UK. From 4 - 8 June, 2008, 41 members of delegation from the Korea River Association visited Japan to see rivers and watersheds in Ishikawa Prefecture and surrounding Hokuriku region. 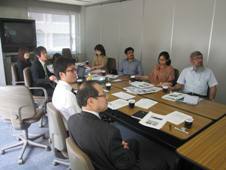 ARRN Secretariat coordinated with concerned organizations on the Japanese side (such as Kaga City Government, Civil Engineering Division of Ishikawa Prefecture Government, Komatsu/Kaga Water Village Restoration Committee, Hokuriku Ecology and Civil Engineering Society, etc. 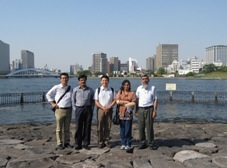 ), and Prof. Tamai, the chairperson of ARRN, joined the tour to the Sai River that flows through Kanazawa City. The tour to restoration sites on rivers and water villages in Hokuriku region was a success in consolidating Korea-Japan relations in the field of river environment restoration. 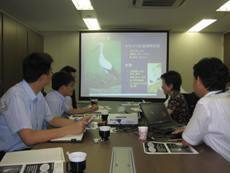 ARRN PR material "Introduction of Asian River Restoration Network" has been uploaded. Background, objective, organization, major activities, membership benefits and future plan are introduced in this presentation material as an overview of ARRN. On January 9, 2008, ARRN/JRRN Secretariat and the Secretariat of PEMSEA (Partnerships in Environmental Management for the Seas of East Asia) had a meeting to exchange opinions. PEMSEA is an international organization that carries out projects financed by the world largest environmental fund GEF under the control of the United Nations Development Plan (UNDP). 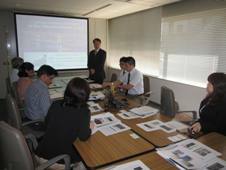 PEMSEA provides technical assistance and expertise for projects conducted in East Asia. Future cooperation between ARRN and PEMSEA is expected as coastal management cannot be separated from inland watershed management. 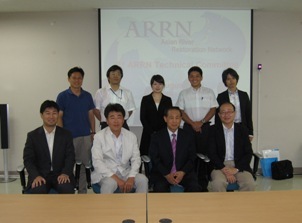 On January 9, 2008, ARRN/JRRN Secretariat and the Secretariat of NARBO (Network of Asian River Basin Organization) had a meeting to exchange opinions. NARBO is an international network established in 2004 with the objective of promoting integrated water resources management (IWRM). ARRN expects cooperation with NRBO will further be enhanced in the field of water environment restoration. 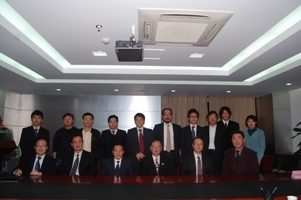 On December 17, 2007, experts from Korea Institute of Construction Technology (KICT) and Korean Federation of Water Groups visited Japan and made discussions with ARRN Secretariat on use of signing on rivers and means to inform the public. The Secretariat also introduced ARRN activities. 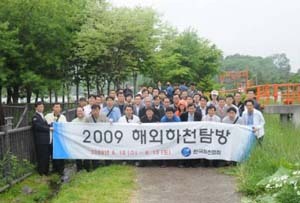 On November 29, 2007, delegates from Dongducheon City, Korea arrived to visit river restoration sites in Japan. 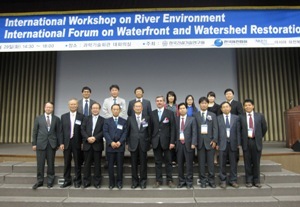 In the discussion on river restoration, ARRN/JRRN Secretariat introduced actions taken to improve river environment in Japan and described outline of ARRN activities, and the delegates explained needs of river restoration at the municipal level in Korea. 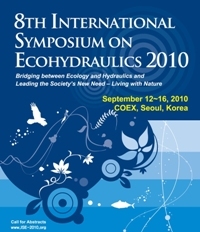 On the 17th May 2007, the "Korea Water Resources Association 2007 Annual Conference" was held in Pyeongchang, Korea. At this conference, which attracted many researchers specialised in the field of water resources not only from Korea but also Japan, China and New Zealand, ARRN secretariat introduced ARRN as an international network concerning river restoration. We also had an inspection of river restoration sites in and near Seoul and observed civil activities in the areas of the Cheongyechen running through the centre of Seoul as well as the Yangajecheon, where the first river restoration project in Korea was implemented.